Reps. Cory Gardner, Mike Coffman, Scott Tipton, and Doug Lamborn. Last September, the Front Range urban region of Colorado was hit by the worst flooding in a generation. A freak storm parked over the mountains immediately west of Denver and Boulder, dropping over a year's worth of precipitation in a matter of days. Thousands of homes were damaged or destroyed, whole towns were cut off from assistance, and residents were evacuated by helicopter in a massive rescue effort by the Colorado National Guard. The damage done by the late September floods along the Front Range dwarfed the resources available to the state of Colorado to respond, and very early on in the disaster it became obvious that a large infusion of federal disaster relief would be necessary to recover. Every member of Colorado's congressional delegation, Republican and Democrat, joined together in requesting emergency disaster relief funding. Unfortunately, past votes by Republican members of Colorado's congressional delegation came back to haunt the entire state. 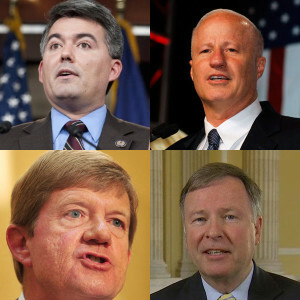 Early this year, Colorado Republican Reps. Cory Gardner, Scott Tipton, Mike Coffman, and Doug Lamborn all voted against relief legislation for victims of a much greater disaster in terms of property damage and loss of life. Hurricane Sandy, which hit the East Coast just before the 2012 presidential elections, killed nearly 300 people in seven nations and did an estimated $65 billion in damage in the United States. Some of the worst-affected areas were coastal New Jersey and New York City. "They're hypocrites. That's what they are," Christie said of the Colorado Republicans during a telephone town hall meeting Thursday night, in comments first reported by the Newark Star-Ledger. But, he added: "We can't be vindictive. Because we have to be concerned about the actual people that are being hurt." In the end, principally through the work of Democratic Colorado Senators Mark Udall and Michael Bennet, Colorado received the federal disaster relief money needed, and Gov. John Hickenlooper has proudly overseen a recovery that is moving along ahead of schedule. Rep. Peter King, Republican of Long Island, said of his colleagues from Colorado, "They should just thank God, we didn't use the same tactics against them that they used against us." Even so, New Jersey Sen. Jeff Chiesa placed put a hold on Colorado's aid request until transportation officials assured him that they could get the money from a funding source other than the Hurricane Sandy legislation that Colorado Republicans had opposed. In contrast to the headlines this incident made in New York and New Jersey, local Colorado press downplayed the story, and focused on the petulant response Rep. Cory Gardner that he had voted against the Hurricane Sandy aid bill because it didn't contain enough for Colorado flood relief. Never mind that other Colorado Republicans like Rep. Doug Lamborn simply thought the bill was loaded with "pork," or that Colorado Democrats nonetheless supported the bill. Perhaps there was a collective judgment in the local media that, with the state gripped by a major disaster, this unpleasant political sidebar just wasn't what Coloradans wanted to read about. But be assured, New York and New Jersey aren't going to forget. This could be the first time I've ever agreed with Peter King. This wouldn't be the first time I agreed with King. He was on the side of the angels during the Republican hostage drama, oops, I mean the government shut down. It's my state that got clobbered and I still think our Republican delegation had a lotta damn gall to go to FE999MA with their hands out after being so pissy about Sandy.